Terribly Interesting: It Was the Second Annual. 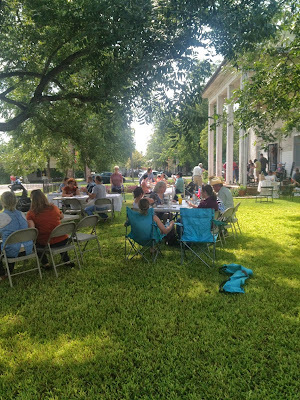 If you love a good Southern picnic, sweet tea brimming from Mason jars, and witty banter by the bucket, you would have loved to be here Saturday. We had the best little fish fry you could sink your teeth into. I am already looking forward to our Centennial celebration next year. I have pinned so many ideas to Pinterest that you would think I was getting married. This is going to be the stuff of Steel Magnolias, people. Let's just go ahead and make the special announcement. Britton wrote me back. She said they would come next year. You may want to go ahead and purchase your tickets. We now tout celebrity guests. We really did have a great day of light-hearted fun. My heart was full as I saw so many people that I love enjoying good food and each other. Children played on our tree and swang from our rope swings. Frisbees were tossed and guitars were played. It was a perfect day for making memories. We don't have these kinds of days near enough in our society any more. Mark your calendars for next October. Step back into the days of Hank Williams and celebrate the good Lord with us. Miss Lulu sold enough of her art to purchase some chickens for World Vision. My man sold an enormous amount of pie. I sold a large amount of art work. Our small town has a parade each year that any one can get in. Seriously, bring your friends and walk the three streets of Fentress. Stephen, my brother from another mother (and father for that matter) came and cooked fish all day. Andy did too. Who does that? I should send them a water bottle with my face on it. Truly, I am really grateful. I cannot imagine trying to do this without the love and support of this family. *Stephen also made the dining room table. We had a little under a hundred people show up throughout the course of the day. It was wonderful. It's hard doing what we do. We deal with a lot of rejection and hurt as we try to love on people. If people are wrestling with God through issues, they are going to do the same with us. On top of that, the project that we have taken on is so daunting and overwhelming. It takes a certain type of crazy to buy and old mansion and restore it. Then, we have buckets of people who are willing to sacrifice their Saturday to come listen to music and eat fish in our yard in the middle of nowhere. I am so touched and grateful for all of you. Your generosity is a glimpse into the heart of Jesus to us. Thank you. There's just something about having all the people you love in one spot together. Here's a note that was left to us on the giant Jenga pieces. We also received one from Britton and Jeff. I think it was a forgery. It said, "Thanks for all the fish. love, Britton and Jeff"
Thank you for your love and support (and your humor). We loved every minute of it. Keep praying for us to pay this place off. We raised enough money to house and feed lots of people over the next year. Thank you kindly! Love y'all.